Bring your laptop, choose any space available in our common areas of Old San Juan, and just plug and play. At the end of the day, you pack up and choose a new spot the next weekday. It’s the epitome of coworking: doing your best work while enjoying the benefits of joining our community of doers. As a member, you also get to use our exclusive business address for mail and permits, receive discounts on add-on conference room hours, and access to other premium perks. Join our community of doers! It’s ideal for those who don’t need a private office, or even the same desk every day, just a committed space to work and access to a conference room. Settle down on a comfy spot in our common areas, connect to Aeronet’s Gigabit1, and delight on our freshly-brewed coffee & snacks while you work. Get inspired to do your best work in our community of doers. Check out what’s included in the Café membership and the amenities included in every Piloto 151 membership. Available in Old San Juan. Book workspace at any other Piloto 151 location for $50/day. 1 hour a month included with your membership. Book extra conference room hours for just $18/hour in Old San Juan. Our conference room has capacity for up to 13 guests. to use your conference room hours in any Piloto location. As a Café member, you receive your own personal code to print in our Old San Juan Copy Center. You can print, scan to email, and make copies. You will be charged at the end of the month: $0.10/copy for B&W and $0.20/copy for Color. 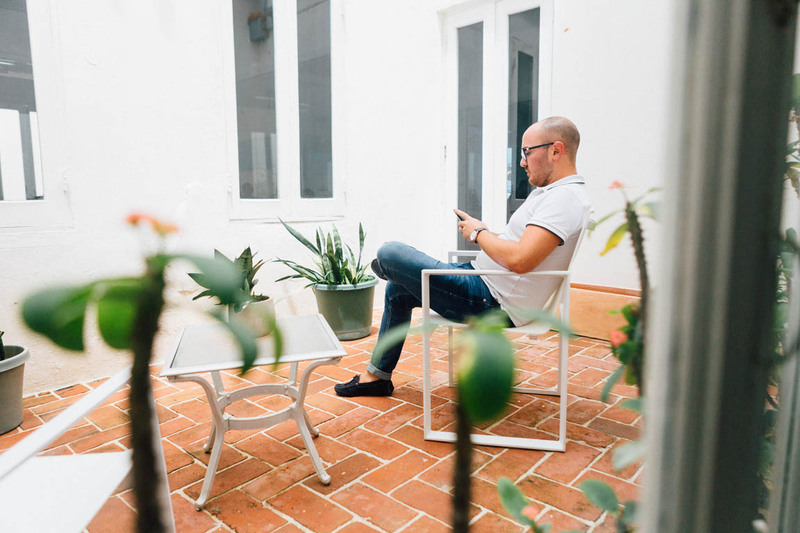 Our indoor/outdoor terraces, ping pong tables, and kitchen lounge in Old San Juan are tailor-made spaces perfect for quick meetings with a guest, take a call, and enjoy a coffee break. As a Café Member in Old San Juan, you receive one complimentary Conference Room hour and add more as you need with member discount of $18/hour. Our Conference Room located in the 2nd floor has capacity for 13 guests. Our Gallery Events space located in the 1st floor has capacity for 100 guests. Both are equipped with AV equipment. Book the conference room through your digital account in the Members Area or call the front desk of your location of choice. Piloto staff is onsite Monday to Friday from 9:00 AM to 6:00 PM for tours, reception services and front-desk help. Is the Cafe membership a flat payment of $250 a month?